Conductive Grid Dividable Containers Protect Sensitive Electronic Components from Typical Electromagnetic Interference. 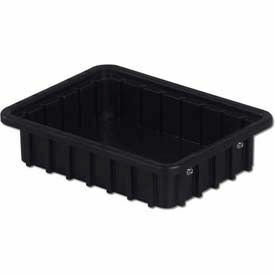 These ESD stackable storage boxes are made with injection molded carbon filled copolymer polyethylene. Multi-ribbed external sides provide high impact strength. The Electrostatic Decay Rate of these non conductive boxes is tested to meet Mil Spec Mil-B-81075B at less than 0.1 seconds. Dividable containers provide a surface resistivity at less than 105ohms when tested per ASTM-D257. These dividable containers are ideal for use in commercial, industrial, electronics and healthcare markets for storage, assembly, fabrication and distribution applications. Allows secure stacking with or without lids. Lid, Length and Width Dividers and Label Holder sold separately. Sold in carton quantities. Available in Black only. 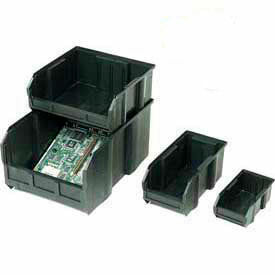 Conductive Stacking Bins Protect Electronic Components. The sensitive, electrical equipment needs to be stored in a secure storage unit that will not interfere with the conductivity of the items. The conductive bins protect electronic parts from static electricity and electromagnetic interference (EMI) with carbon filled copolymer polypropylene construction, provides a barrier that these fields cannot penetrate, and also prevents the buildup of electrostatic charge. Chemical, oil and grease resistant. Tested to meet Mil Spec Mil-B-81075B. Surface Resistivity less than 105ohms/sq. when tested per ASTM D257. These bins with a wide ledge so that you can stack these bins on top of each other, which takes up less storage space. LEWISBins™ ESD-Safe Divider Boxes Are Used For Commercial, Industrial, Electronics And Healthcare Markets For Storage, Assembly, Fabrication And Distribution Applications. 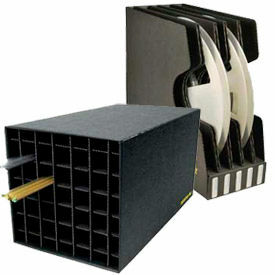 LEWISBins™ ESD-Safe Divider Boxes are made of polypropylene for long lasting durability. Strong stacking ridge and innovative ribbed walls ensure high performance. Provides load capacity of 40 pounds per container. 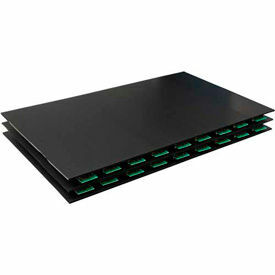 Compatible with many kinds of racking, shelving and material handling equipment. 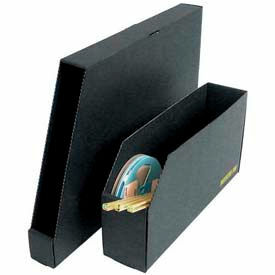 Can be divided into compartments on 1.25" centers with easy-to-add dividers. Anti-static cardholders are available for ESD-Safe identification (call for details.) 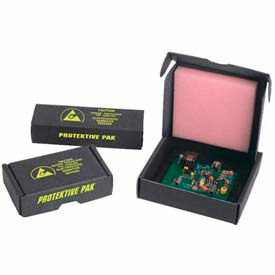 Two optional ESD-Safe Divider Box Covers are available for added product protection. Choose from Insert Cover or Heavy-Duty Solid Cover. Faraday Cage created when used with ESD-Safe Divider Boxes. Color is Black. Package quantities are 3, 4, 6,8,12, 16 and 24. Number of long divider slots are 7, 11 and 15. Number of short divider slots are 5, 7 and 11. Available in a variety of outer and inner dimensions to meet job specifications. 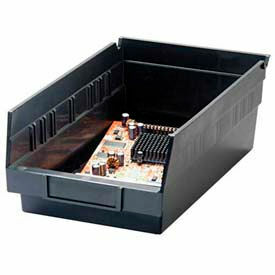 Conductive Shelf Bins Provide Safe, Component Storage. The conductive Shelf Bins help protect electronic components from static electricity and electromagnetic interference (EMI) with carbon filled copolymer polypropylene construction. Tested to meet Mil Spec Mil-B-81075B. Surface Resistivity less than 105 ohms/sq. when tested per ASTM D257. 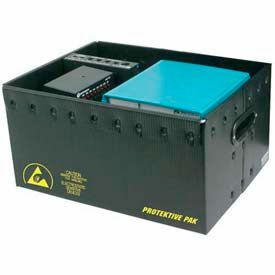 Fiberglass ESD-Safe Boxes Provide Optimal Product Protection. 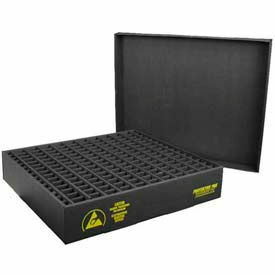 The ESD-Safe Boxes are made of fiberglass reinforced thermoset composite for long lasting durability, with exceptional weight-carrying capability and possess superior physical properties over thermoplastic and corrugated products. They will not bend or sag under heavy loads and can be readily integrated into automated applications. ESD-safe conductive products have a surface resistivity of less than 105 to 106 ohms. Fibrestat products meet or exceed ANSI/ESD S20.20 standard for ESD protection. ESD stacking containers ensure optimum space utilization during assembly operations and may be used to form mobile work stations. Fiberstat containers ensure complete protection from electrostatic discharge for the life of the product. They may be used consistently in temperatures ranging from -60°to 250°F (-51°to 121°C) and are resistant to cutting oils, greases, solvents, mild acids and alkaline solutions within a pH rating of 3.0 - 10.0. Stacking containers are easily cleaned in hot water or steam with standard detergents. Optional Lids are available for certain models. ESD In-Plant Handle Containers With Fixed Dividers Are Used For Shipping, Handling And Storage Applications. ESD In-Plant Handle Containers With Fixed Dividers are made from 100% recycled corrugated cardboard for long lasting durability and dependability. Variety of sizes available to meet shipping requirements. Shields ESD sensitive items from charges and electrostatic discharges with lid in place. Static dissipative surface resistivity of 10E6 - 10E8 ohms. Buried shielding layer minimizes potential of sloughing and rub-off contamination. Easy assembly without need for tape, glue, or staples. Lid included to shield ESD sensitive contents. Reusable. Made in U.S.A. No assembly required. Variety of dimensions, compartment sizes/quantities and PCB measures available to meet storage requirements. Color finish is Black. Package quantity is 1. 1 Year Limited Warranty. ESD In-Plant Handle Containers With Adjustable Dividers Shields ESD Sensitive Items From Charges And Electrostatic Discharges With Lid In Place. ESD In-Plant Handle Containers With Adjustable Dividers are made from 100% recycled corrugated cardboard for long lasting durability and dependability. Variety of sizes available to meet shipping requirements. Provides ESD and physical protection for sensitive circuit boards and components. Maximum flexibility with up to 30 combinations using same storage container, lid, and partitions. Static dissipative surface of 10E6 - 10E8 ohms minimizes potential of sloughing and rub off contamination. Reusable. Made in U.S.A. No assembly required. Variety of dimensions, compartment sizes/quantities and PCB measures available to meet storage requirements. Color finish is Black. Package quantity is 1. 1 Year Limited Warranty. Plastek ESD In-Plant Handler Containers with Fixed Dividers Are Used For Shipping, Handling And Storage Applications. Plastek ESD In-Plant Handler Containers with Fixed Dividers are made from extruded, high impact polypropylene materials with a rolled over side construction and steel wire frame for greater strength and long lasting durability and dependability. Variety of sizes available to optimize fit to product size. Conductive 10E2 - 10E4 ohm material provides physical path-to-ground protection. Static dissipative foam bottom, providing ESD and shock protection. Conductive plastic hand holes allow for ease of handling. Static Dissipative partitions made from Protektive Pak® impregnated corrugated material. Chemical and moisture resistant. Used for use where corrugated and/or paper products cannot be used. Economical alternative to injection molded products. Lid included. Reusable. Made in U.S.A. No assembly required. Variety of dimensions, compartment sizes/quantities and PCB measures available to meet storage requirements. Color finish is Black. Package quantity is 1. 1 Year Limited Warranty. ESD Totes, Nesting And/Or Stackable Are Used For Transporting And Storing ESD Sensitive Items. ESD Totes, Nesting And/Or Stackable are made from extruded, high impact chemical and moisture resistant polypropylene materials with a steel reinforcing frame and double-thickness, rolled over side construction for long lasting durability and dependability. Variety of sizes and styles available to meet shipping and storing requirements. 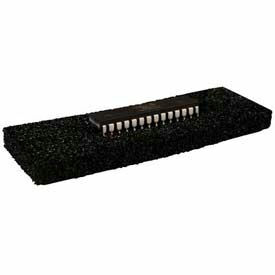 Provides physical path-to-ground protection with conductive material. Efficient means of transporting items to assembly area and empty totes back to store room for refilling. Conductive 10E2 - 10E4 ohm material provides reliable path-to-ground protection. Also for use where corrugated and/or paper products cannot be used. Economical alternative to injection molded products. Reusable. Made in U.S.A. Some models require assembly. Styles are Nesting Note and Stackable/Nesting Note. Color finish is Black. Dimensions and temperature tolerances vary per style. Package quantity is 1. 1 Year Limited Warranty. ESD Shipping and Storage Containers Provide An Efficient Means Of Shipping And Storing Small ESD Sensitive Items. ESD Shipping and Storage Containers are made from extruded, high impact polypropylene materials with a rolled over side construction and a steel wire frame for greater strength and long lasting durability and dependability. Variety of sizes and styles available to meet shipping requirements. Conductive 10E2 - 10E4 ohm material provides physical path-to-ground protection. Static dissipative foam bottom offers ESD and shock protection. Conductive plastic hand holes allow for ease of handling. Static Dissipative partitions made from Protektive Pak® impregnated corrugated material. Chemical and moisture resistant. Used for use where corrugated and/or paper products cannot be used. Economical alternative to injection molded products. Lid included. Reusable. Made in U.S.A. Some models require assembly. Lids also available. Styles are Container and Stackable Container. 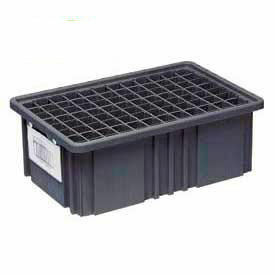 Types are ESD Shipping and Storage Boxes and ESD Storage Containers. Color finish is Black. Dimensions and temperature tolerances vary per style. Package quantity is 1. 1 Year Limited Warranty. Reel And Tube Storage Containers Provide An Economical Solution To Storing Reels. Reel And Tube Storage Containers are made from 100% recycled corrugated fiberboard or extruded, high impact polypropylene material for long lasting durability and dependability. Variety of sizes and styles available to meet shipping requirements. Select styles include conductive plastic handles and removable lids. Constructed with double sides and ends. Stable design eliminates falling when only partially full. When cover is closed, Faraday Cage effect restricts electrostatic charges to exterior of box. Static dissipative surface. Identified with ESD Protective Symbol (Ref: ESD 8.1). Reusable. Made in U.S.A. Some models require assembly. Styles are Container, Container w/Lid, Container w/Slots, Container with Stacking Corners, and Container w/Tube Cell. Color finish is Black. Dimensions, compartment sizes/quantities and temperature tolerances vary per style. Package quantities are 1, 5, 15 and 25. 1 Year Limited Warranty. ESD Component And Circuit Board Shipping and Storage Boxes Provide An Efficient Means Of Shipping And Storing Small ESD Sensitive Items. ESD Component And Circuit Board Shipping and Storage Boxes are made from 100% recycled corrugated cardboard with pink static dissipative foam laminated to top and conductive crosslink black polyethylene foam in bottom for long lasting durability and dependability. Variety of sizes and styles available to meet shipping requirements. Provides ESD shielding with lid closed. Faraday Cage effect restricts electrostatic charges to exterior. Foam dimensions are ± 1/16 inch. Foam cushioning reduces stress from physical shock. 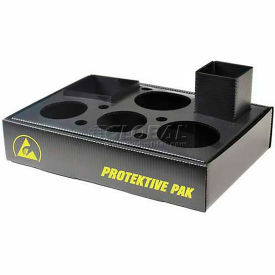 Static dissipative foam in Protektive Pak® box. Buried shielding layer minimizes sloughing and rub-off contamination. Custom foam configurations available. Made in U.S.A. No assembly required. Styles are Conductive Lead Chip, ESD Circuit Boards and ESD Small Components. Types are ESD Shipping and Storage Boxes, ESD Shipping and Storage Boxes -Box Only, ESD Shipping and Storage Boxes w/Black Foam and ESD Shipping and Storage Boxes w/Foam. Color finish is Black. Dimensions and compartment sizes/quantities vary per style. Package quantity is 1. 1 Year Limited Warranty. 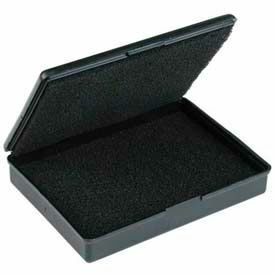 Conductive Hinged Boxes With Foam Provide An Efficient Means Of Storing ESD Sensitive Items. 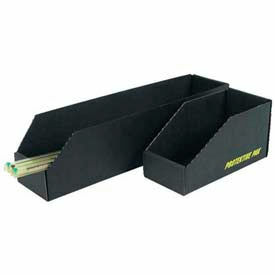 Conductive Hinged Boxes With Foam are made of polypropylene for long lasting durability and dependability. Variety of sizes available to meet storage requirements. Provides ESD protective storage and handling of ESD sensitive items. ESD protective symbol molded into cover of box. Electrostatic charges able to be removed when grounded. Secure snap closure keeps boxes from accidentally opening. Conductive foam inserts provide protection from vibration and shock. Identified with ESD protective symbol as required per ESD S541. Identified with Desco Industries web site for traceability. Made in U.S.A. No assembly required. Variety of sizes available to meet storage and handling requirements. Color finish is Black. Dimensions and temperature tolerances vary per model. Package quantity is 1. 1 Year Limited Warranty. ESD Bin Boxes Provide Reliable Path To Ground Protection. 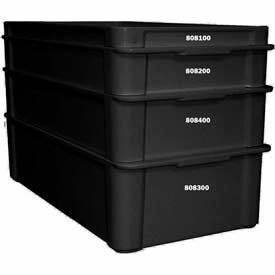 ESD Bin Boxes are made from extruded, high impact polypropylene or 100% recyclable corrugated fiberboard for long lasting durability and dependability. Variety of sizes and styles available to meet shipping requirements. 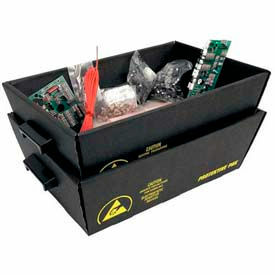 Open Bin Box provides physical protection with conductive material. Closed Bin Box offers economical, efficient method of storing static sensitive electronic devices. Constructed from unique buried conductive layer of impregnated corrugated fiberboard with static dissipative surface. When enclosable cover is closed, Faraday Cage effect restricts electrostatic charges to box exterior. Shipped knocked-down allowing for easy assembly. Economical alternative to injection molded products. Reusable. Lead-free RoHS compliant. Made in the U.S.A. Styles are Closed Top and Open Top. Color finish is Black. Dimensions vary per style. Package quantity is 1. 1 Year Limited Warranty. ESD Bin Boxes For Reels And Rail/Dip Tubes Are Designed To Safely Store Both Reels And Rail/DIP Tubes In The Same Bin Boxes. ESD Bin Boxes For Reels And Rail/Dip Tubes are made from extruded, high impact polypropylene or 100% recyclable corrugated fiberboard for long lasting durability and dependability. Variety of sizes and styles available to meet shipping requirements. Closed style with better loading from side. Open style allows better loading from above. Also used for storing, kitting, or transporting during work-in-process operations. Cell identification labels included. Buried shielding layer minimizes sloughing and rub-off contamination Shipped knocked-down allowing for easy assembly. Reusable. Lead-free RoHS compliant. Made in the U.S.A. Styles are Closed Top and Open Top. Color finish is Black. Dimensions vary per style. Package quantity is 1. 1 Year Limited Warranty. 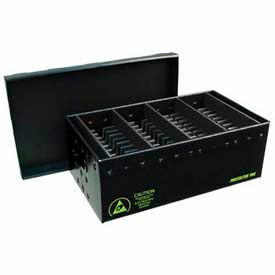 ESD Workstation Organizers Are Designed For Organizing Workbench Tools. ESD Workstation Organizers are made of impregnated corrugated polyethylene for long lasting durability and dependability. Material construction offers greater durability than coated or printed material. Static dissipative surface of 10E6 - 10E8 ohms. Marked with ESD Protective Symbol per ANSI/ESD S541. Ships flat knocked down and unassembled. Made in U.S.A. Styles are Compact Organizer, Small Organizer and Universal Organizer. Color finish is Black. Dimensions and temperature tolerances vary per style. Package quantity is 1. 1 Year Limited Warranty. ESD Board Handling Work Surfaces Are Designed To Fit Most Transportation Carts. ESD Board Handling Work Surfaces are made of 100% recycled impregnated corrugated fiberboard and polyethylene foam for long lasting durability and dependability. 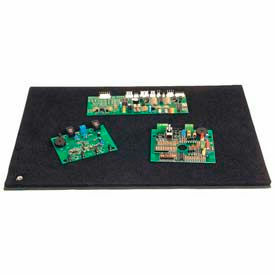 Board Handling Work Surface offers portable ESD work surface used to transport populated but unsoldered circuit boards. Static dissipative foam laminated to Protektive Pak® corrugate. Shuntable foam allows board lead to be kept at equipotential. Includes male grounding snap. Pro-Mats Work Surface includes two installed 3/8 inch socket snaps with stud snaps available. Resists damage by hot soldering irons, solder, or flux. Lead-free RoHS compliant. Reusable. Made in U.S.A. No assembly required. Styles are Economical Work Surface/Female Snaps, Portable Board Handles/Female Snaps and Portable Board Handles/Male Snaps. Color finish is Black. Dimensions and temperature tolerances vary per style. Package quantity is 1. 1 Year Limited Warranty. Plastek™ Conductive Fluted Separator and Protective Sheets are Used As Dividers Or Lining Shelves. Plastek™ Conductive Fluted Separator and Protective Sheets are made from extruded high impact polypropylene materials for long lasting durability. Chemical and moisture resistant provides optimum performance. Reusable and will not lose shielding and static charge decay properties. Conductive Rtt 1 x 10E2 to <1 x 10E5 ohms mts ANSI/ESD S20.20 worksurface required limit per ANSI/ESD S4.1 and ESD TR53. Available thicknesses are 1/8 and 5/ 32. Dimensions vary per type. Conductive And Static Dissipative Foams Are Used For Lead Insertion Packaging By Providing ESD And Physical Protection To Component Leads. Conductive And Static Dissipative Foams are made from conductive crosslink polyethylene foam for long lasting durability and dependability. Variety of small, ready-to-use pieces and styles available to meet shipping and storing requirements. Shuntable design brings leads to equipotential minimizing exposure to discharge. Non-contaminating, corrosion resistant materials will not affect solderability. Cross linked foam will not particulate making it used for critical environments. Reusable. Made in U.S.A. Some models require assembly. Styles are Cushion Grade and Lead Insertion Grade. Types are Conductive Foam and Static Dissipative Foam. Color finishes are Black and Pink. Dimensions and temperature tolerances vary per style. Package quantity is 1. 1 Year Limited Warranty.